Playing with Papercrafting: Thanks for the Pals and Important News from Stampin' Up! 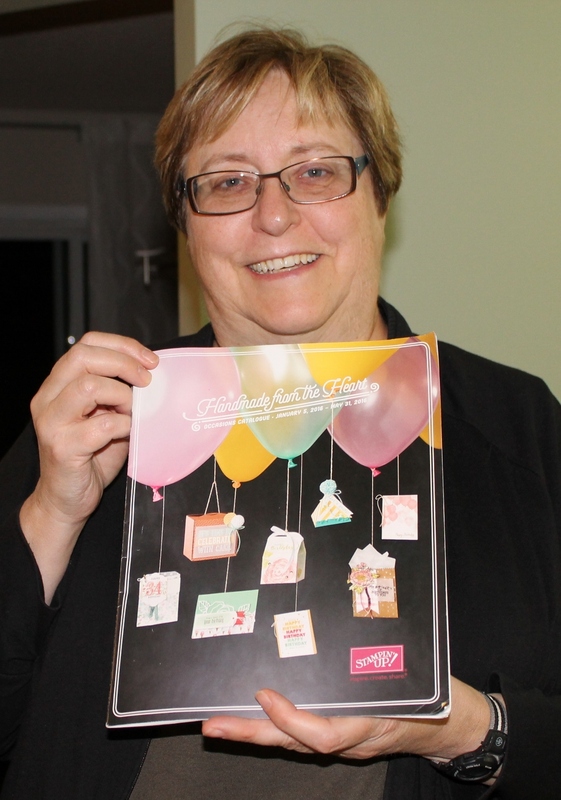 Thanks for the Pals and Important News from Stampin' Up! It's my first event with a new phone but because of that, I've encountered some technical issues downloading all the photos I took, so I'll have to just give you a photo of the new Occasions Catalogue and hope that will tide you over! 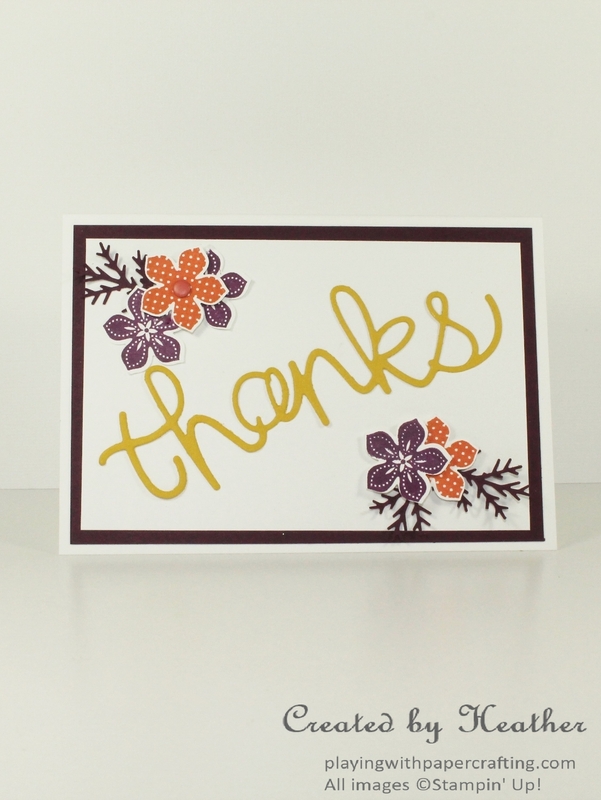 In the meantime, I have a Thank You card that I created for the Pals Paper Arts Challenge. I feel I need to defend myself a bit for this one! 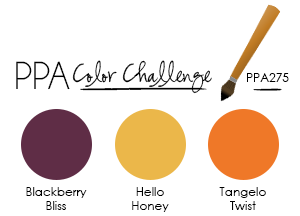 I needed some thank you cards for orders going out, but I also wanted to enter the Pals Challenge because these colours are so warm and inviting, so I thought I would kill two birds with one stone, so to speak, and make a thank you card for the challenge. I wanted Blackberry Bliss to be my base layer, and then I pulled out the Hello You Thinlits and saw that there was a Thanks as part of it! I thought it would look great with Hello Honey and for the Tangelo Twist, I could stamp a flower or two. Aha! Petite Petals! 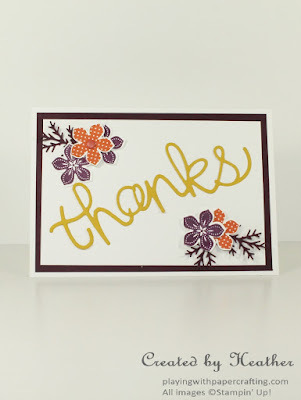 I haven't used that stamp set in ages, and I could punch out the flowers and add them to the card. Anyway, I had it all designed and went to the challenge site to download the Challenge banner and right there at the top of the entries was...my card's doppelganger, more or less! Honestly, I did not peek once at it. All I saw was the banner for the challenge and a couple of the Design Team Samples. I guess great minds think alike! One thing I did that I do not often do was to use another company's product for the little spiky leaves. It's a Martha Stewart punch that I've had forever and I've always really loved it, but I haven't used it in a long time. I thought it would work well with the small Petite Petals flowers. So I ended up with a somewhat clean and simple design that works for me! 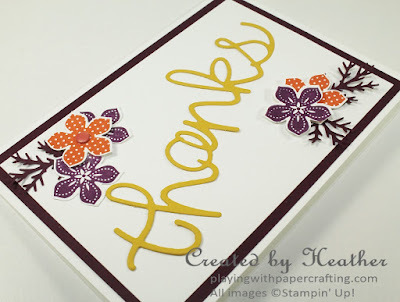 This is the first time ever that Stampin' Up! 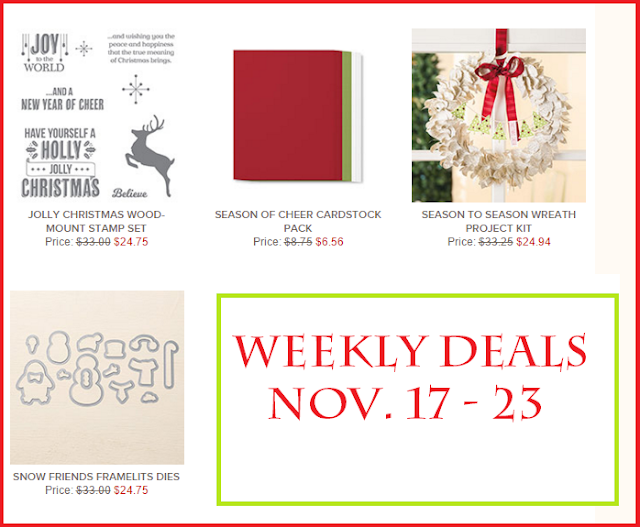 is publishing a retiring list for the Holiday Catalogue. It's a new policy which will help everyone to know which products they need to get before they are gone for good and which products will be carried over and still available after the catalogue period has ended. It will be a regular feature with every catalogue now. 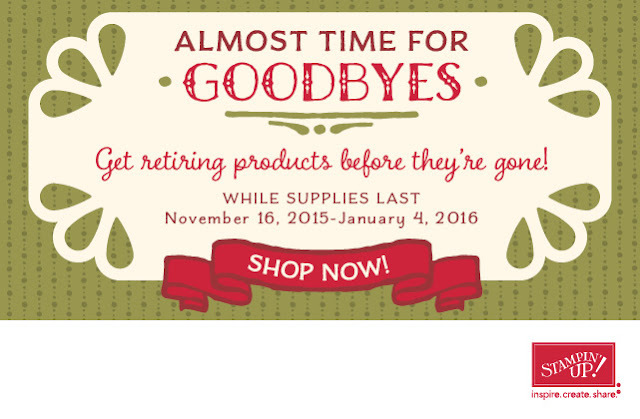 You need to know that the stamp sets will all be available until Jan. 4, 2016, but the other products will be available only as supplies last. That means you need to act fast on those items before they sell out. You will also be able to access it from the right menu on my blog until January 4th.